Universal's long-gestating Battlestar Galactica movie is still moving forward, with director Francis Lawrence offering an interesting update while promoting his new movie Red Sparrow. While there is still no indication as to when production may actually take place, the filmmaker has been developing the script with Westworld co-creator Lisa Joy, and while no specific plot details have been divulged, the filmmaker revealed there is a strong possibility some of the iconic roles from the TV series may be gender-swapped. Here's what the director had to say when asked about the possibility of gender-swapping certain Battlestar Galactica roles. "Yes absolutely 100 per cent! I'm not going to give any details but 100% there's room for that." While there has been little to no movement on the project since Lawrence was brought on as director in June 2016, the director revealed in an interview last month that Battlestar Galactica is in fact still happening, although he offered no updates as to when casting or filming may begin. The director reiterated his statements from last month, confirming that he's still working on the project with Lisa Joy, but it's been slow going, since he was working on Red Sparrow and she was writing the upcoming second season of HBO's Westworld, with co-creator Jonathan Nolan. "Yeah we're still working on that. I've been developing that for a while. I've been working with Lisa Joy who's been fantastic, she's one of the creators of Westworld and she's been doing a fantastic job.It's taken a while because she's done two seasons of Westworld while writing this and I've been making Red Sparrow while working on this so it's been a while. Yes it's a reimagining, it's not a continuation of the series, it's a standalone piece." What's interesting is the most recent Battlestar Galactica series from creator Ronald D. Moore also featured a gender-swapped character. The Lieutenant Starbuck character originated by Dirk Benedict in the original movie and short-lived TV series, was turned into Captain Kara "Starbuck" Thrace, played by Katee Sackhoff in her breakthrough role. This most recent incarnation of the series ran for four seasons between 2004 and 2009, spanning 73 episodes. The movie will be produced by Bluegrass Films' Scott Stuber, along with Michael De Luca and Dylan Clark for Universal Pictures. Before Francis Lawrence and Lisa Joy were brought on, the studio had brought in writers such as Jack Paglen (Transcendence) and John Orloff (Band of Brothers) although there is no indication as to whether or not any of the material from these older scripts was retained for this new version that Francis Lawrence and Lisa Joy are working on. Still, given the massive fan base for Battlestar Galactica, this movie could be one of the most highly-anticipated projects out there, if it ever gets to a point where it's ready to start filming. 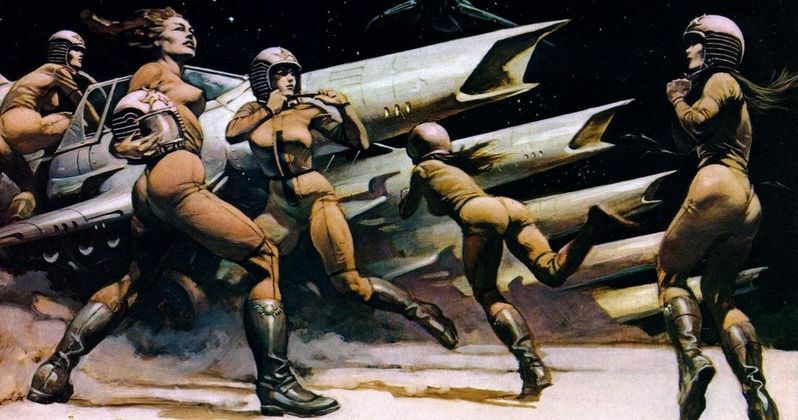 With all of these different versions of Battlestar Galactica out there, there is no word on if this movie will take any specific cues from any of the earlier incarnations or not. Francis Lawrence revealed these new details in an interview with Digital Spy.